It’s officially pumpkin season! 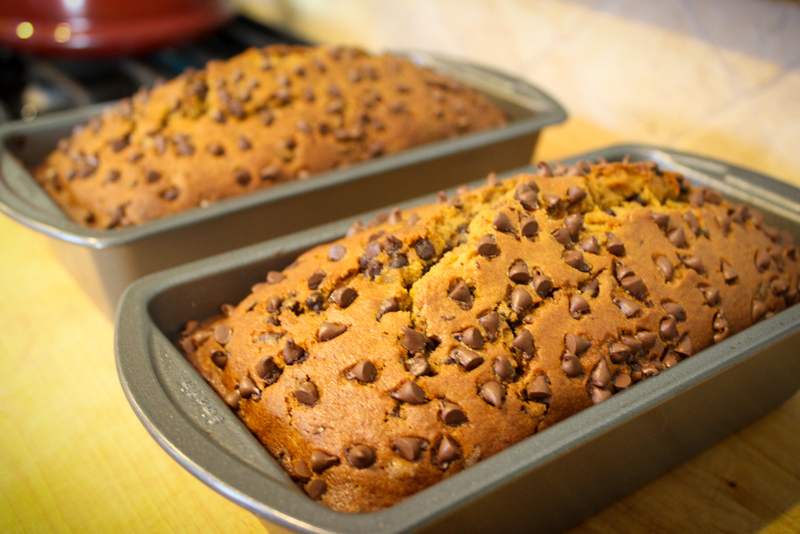 That means we’re digging out our favorite pumpkin bread recipes. This recipe combines the best of both worlds—pumpkin and chocolate. 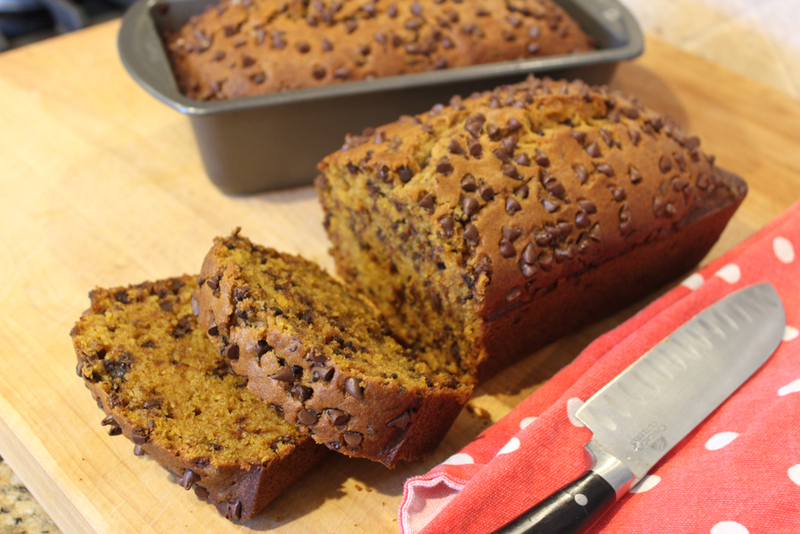 Despite the longer bake time, this bread comes out super-moist and yet still easy to slice. Enjoy it for breakfast or even as a dessert paired with a scoop of ice cream. In a large bowl, combine the flour, cinnamon, nutmeg, cloves, salt and baking soda. 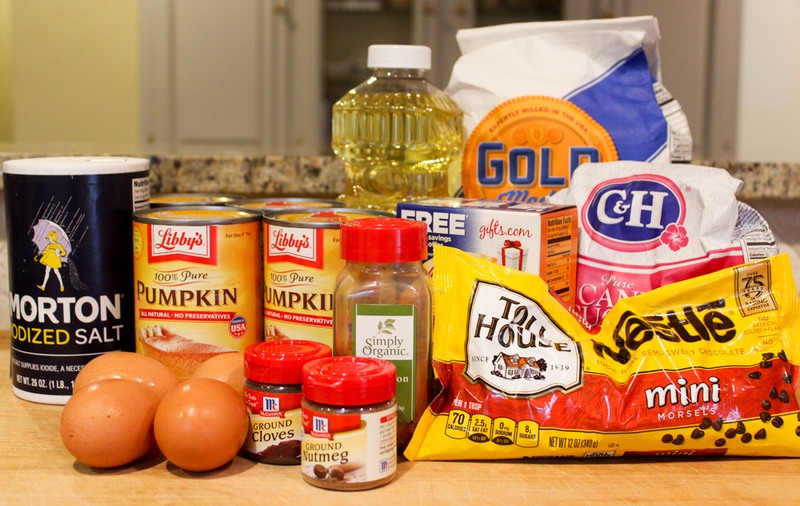 In another bowl, beat the eggs, sugar, pumpkin and oil. Stir dry ingredients into wet ingredients. 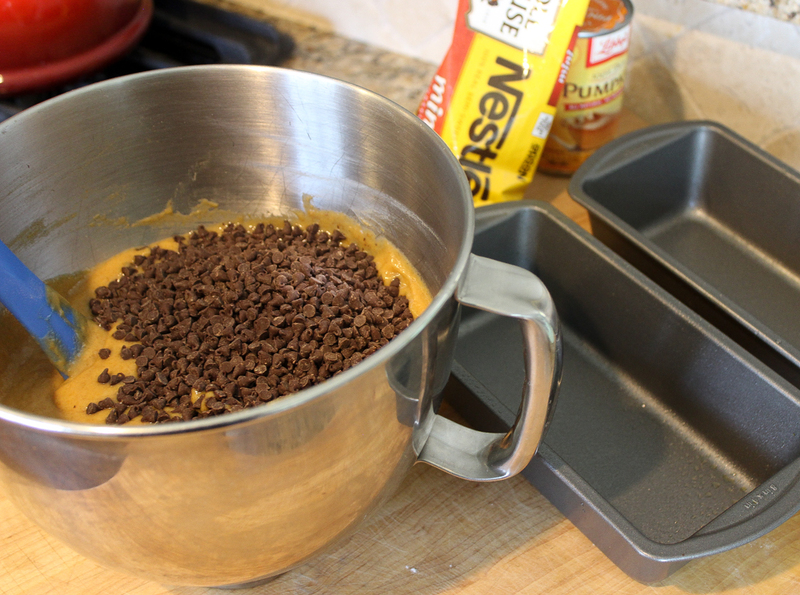 Lastly, fold in 1 1/4 cups of the chocolate chips (reserve 1/4 cup for sprinkling). Pour mixture into two greased 8-in. x 4-in. loaf pans. 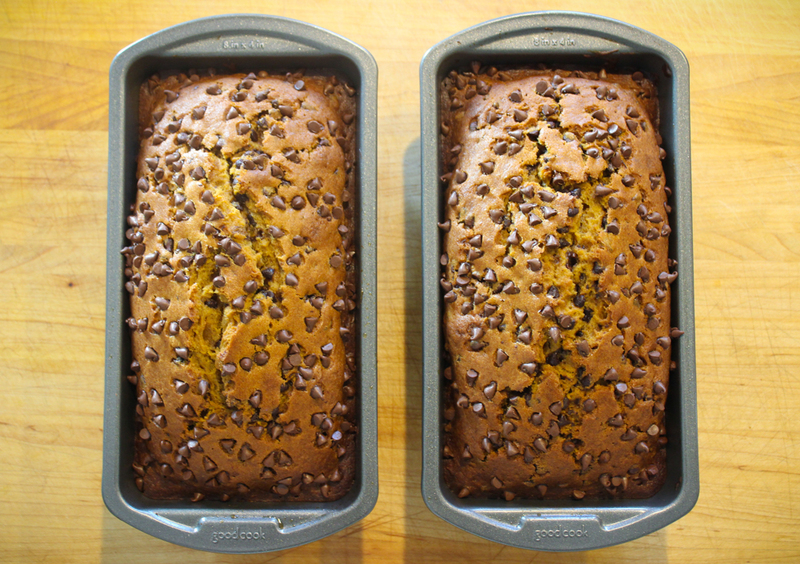 Sprinkle reserved chocolate chips on top of the uncooked bread. Bake at 350° for 60-70 minutes or until a toothpick inserted near the center comes out clean. Cool for at least 20 minutes before removing bread from pans. Another great thing about this recipe? Most of the ingredients you should already have in your pantry. 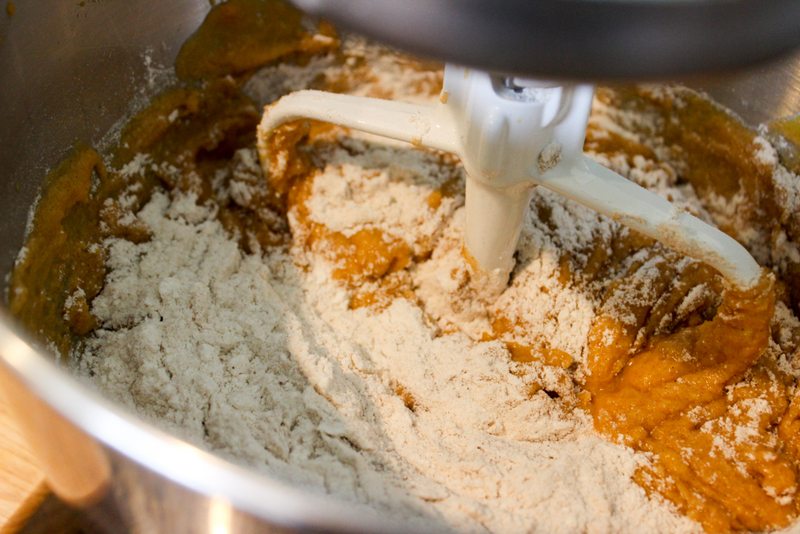 While you can certainly hand mix this recipe, we used a standing mixer. Combine wet ingredients in your mixer bowl and the dry in a separate bowl. Once the wet ingredients are mixed, slowly add the dry ingredients while on a slow speed. The whole thing will be done in no time. If you only have regular sized chocolate chips at home, by all means, use those. We chose the mini because why not? Everything is better mini. If you’re not a huge chocolate fan or just trying to take a healthier path, you can absolutely use the base of this recipe and sub out the chocolate chips for any kind of nut (toasted walnuts would be excellent!). But on the other hand, the chocolate is pretty excellent, too.